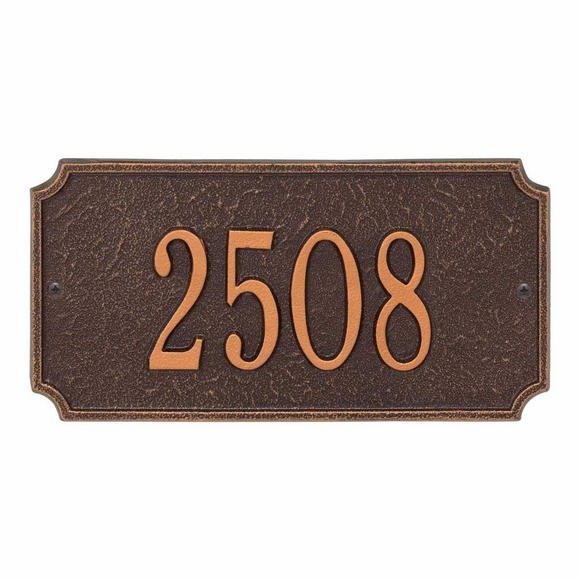 Comfort House Metal Rectangle Home Address Plaque - - Wall mount. Made in USA. Decorative raised border accentuates the decorative cut corners. Holds up to five (5) 3" characters, all on one line. Personalization is permanently�cast into the sign. Ten colors: antique copper, black with gold characters, black with silver characters, oil rubbed bronze, bronze with gold characters, antique brass, black with white character, green with gold characters, pewter with silver characters, and red with gold characters. Small images from left to right: black/gold, black/silver, oil rubbed bronze, bronze/gold, antique brass, black/white, green/gold, pewter/silver, red/gold. Dimensions: 11"W x 5.75"H x 0.325; weighs 1.25 pounds.